Need to know when buses and trains are coming, and where they're going? This is the app for you. 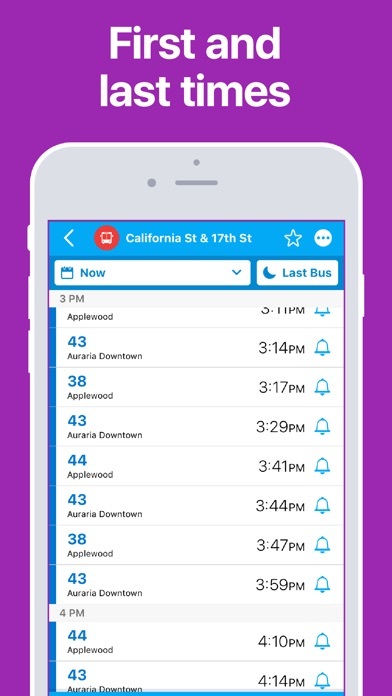 See instantly when your bus or train is going to arrive – and find the quickest way around town with live journey planning. MAIN FEATURES • Countdown boards for buses and trains • Tap on an arrival time to see how far away the vehicle is in real-time • Full seven-day timetables • Quickly see the last train or bus arriving tonight • See every nearby route and where they go • A-to-B directions – takes traffic delays into account and shows you alternative routes • One-tap ‘get me home’ journey planning • Save your favourite stops and stations • Customise a stop's arrivals board so you only see the routes you want to see. 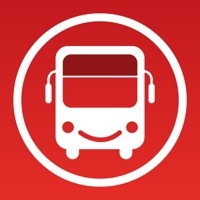 • The best-designed transport app out there - simple and clean, showing you only the information you need The app works best with an active data connection and GPS. Please note that continued use of GPS running in the background can dramatically decrease battery life. It isn’t very easy to try to find today’s schedule for rides, just the one coming up next. I spent a few minutes poking around and still can’t find all the times that Skyride runs to the airport today. I can find every stop that the next run makes. But I can’t find the next run after that. Not to mention that the app is still tied to an iPhone size interface. On the iPad, there should be plenty of room to build a decent UI. The development team needs to find somebody who’s never use the app before, and watch them try to find data on it, to learn how non-developers think. Anytime I try to use the app, it takes forever to figure out where I am or find a train in my area even if I’m at an actual light rail station. It’s not worth the hassle. Great idea though, just needs the bugs worked out. The bus driver left me i was waiting at the stop and passed by me and i waved my hand and kept going. 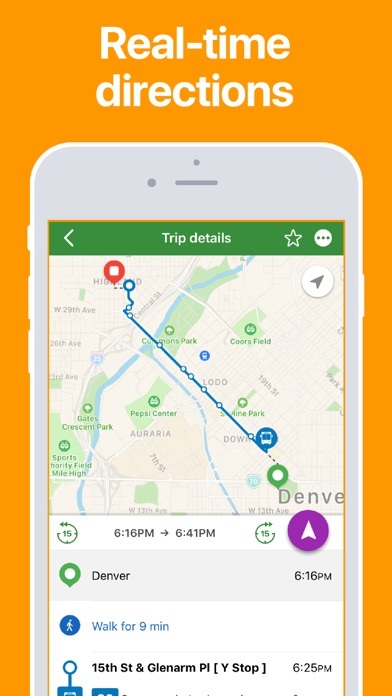 RTD app is absolutely the worst reliable source for accurate times. They calculate your travel time by their schedule rather than the actual time the bus is going to be there. You expect a bus at 1:00 pm and it doesn’t arrive leaving you to wait in Denver winter for another half hour before the next bus (if it does come) to arrive. The absolutely worst transit app ever! How do you buy a ticket on app? Who do you contact for help? I’ve stumbled over this Transit app and surprised by the clarity of options. In fact, some of the suggested routes have not shown up on other apps. So I have taken these new paths home. Very nice. It works fine, not buggy. It generally tells you when your next bus will be. The Plan Trip feature does not always include all buses departing from your initiating point going to your destination, so there might be a better route but the app won’t tell you about it. What I don’t like is that it does not have a feature to tell you when the standard departure times are for a particular route (it will tell you the standard stops). You have to go to the RTD website and pull up the route info to get the times. Overall not a good substitute for paper route booklets. I need to allow a buffer of 10 minutes on either side of the time the train says it will be here. I cannot trust the timeline. The arrival times are never correct. Busses arrive 2-10 minutes BEFORE the app shows them arriving. Thus if you rely on this app you are likely to miss your bus. Try to choose “train only” for directions and busses are still involved. Worst app for navigating Denver transportation. Told me to leave at 1206 to catch a 1226 bus. The distance was 30 minutes walk at least. I’m 35 and in ok shape, not disabled or anything. So just be ware old timers this app straight up lies. App I good and useful. But there were several annoying things. When you zoom out too far on the map, the stations and stops disappear. Please make it so the icons stay no matter what so folks can find their nearest station that way. On the map view, the top left icon (Apple app) that appears to be to sort transportation types does not seem to change anything or open a window to edit filter on the map. Finally, when trying to submit feedback in the app, I cannot press the preview button to advance to the submission stage. So I can not submit feedback. The top right of my screen works fine; verified in a different window within the app. Bus and train times are NOT accurate. And they have the same names on the bus whether they are going North or South. Or East and West. NO distinguishing way to tell without ASKING bus driver EACH TIME you get on a bus. I am a student who use the light rail to commute daily. The times are always off, I find myself constantly trying to find the quickest way home, and trains are always late, arrive earlier than it is listed on the app, or they never arrive at all. I find myself constantly trying to rearrange plans for the day because the app is so inaccurate. I am currently waiting for a train which said it would arrive by 12:34, but I got to the correct station, and when I refreshed the page it said the train had actually arrived around 12:27. Fairly disappointed with this app, I will be better off finding a new method to rely on for my transportation. The app seems to lag 1 bus stop behind. Train navigation seems to be fine. When I first saw this app, I thought it would be fake and wouldn’t actually have live times of the light rail. Boy was I wrong! It’s completely live and tells you all of the times that each train or bus comes to your area, and the estimated amount of time that it will take to get to your destination. I have used it daily for my commute to school! This app gives you no actual information a person can use! You can’t submit any app feedback because the submit button doesn’t work, which is what they do because half the busses won’t show up. So you can’t even tell them. RTD is cancer. 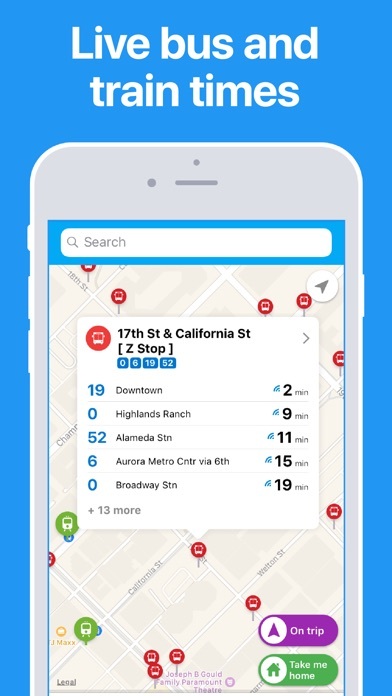 This app shows you route maps and where you are with respect to stops and stations, but doesn’t show you where the train is located on its route so you know how soon it is coming. This was what I was hoping for so I can select the soonest bus or train and time my arrival at the stop or station. I just need schedule info, but this app doesn’t have schedule info. Seems like a pretty basic need, don’t waste your time. Problem #1 is that their in-app “Send Feedback” page doesn’t allow you to submit your message, so there is no way to contact them without digging on the internet to try and find contact info. Proble #2: I wasted my time finding their website and typing out a message only to encounter another error with their contact form - HTTP 401 on their own form submission to their own site. If they can’t even maintain their basic website, I have no hopes for the app to be improved. Now, on to the app: The routing could use an refactor. For a trip from North Boulder to Union Station, a chosen route taking the 204 to FF2, why do you have the trip transfer at Broadway and 20th instead of the downtown boulder station? One reason to do this is to ensure that one can get on the FF2 with luggage or a bicycle. Another benefit is that when people board the FF2 at the station while the bus is just sitting idle is that the trip times will decrease with less people getting on the bus mid-route, decreasing dwell time. Making apps for public transportation should not just check a list of features, it should be tested and thought out to the actual experience. Otherwise it’s just another app in the App Store. I have poor vision and have to have the font larger on my phone. This app does not take that into consideration and adjust accordingly so the words from my search results are a jumbled mess and unreadable. Trip planner has been sending me on routes with detours so I get stranded waiting for a connection that doesn’t come. Bus never comes when it’s due. If you check how long til it arrives, it shows a bus icon approaching. No bus comes. I usually have to wait an additional 15 minutes because the app screwed up navigating the actual bus that was supposed to be due. I’m extremely disappointed. Always late. Do not use this app. It keeps telling me to go to stops that are no longer in use. This is the only issue I have with it, but it's a pretty big issue - I think you're overdue for an update. Tried using trip planner for a 15 minute train ride. App said 27 hours? Double checked. Parameters were correct. DELETE!!!! Not user friendly at all!!! Needs a lot of work!! Does not account for “training vehicles.” Uses scheduled approximations of vehicle locations. I have used this app for several months and I trust emails from Nigerian princes more. 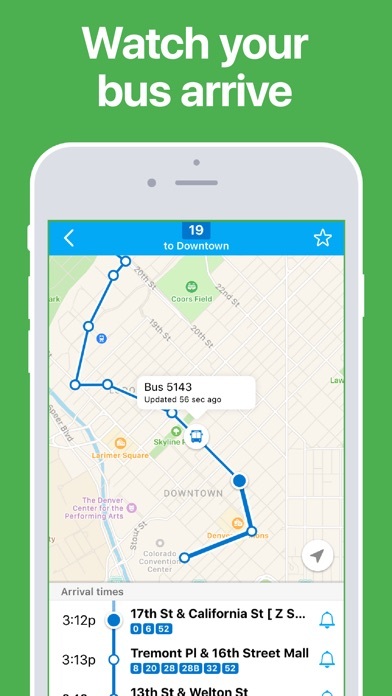 Once your bus is late, it stops tracking and moves on to the next regularly scheduled bus. All I wanted was to use it to buy a light rail ticket and I can’t see how to do that. This app is an epic failure. I want to get the schedule for a route. But it seems like I can only get to the one route that comes close to me. There is absolutely no way to get a simple list or map of routes. This app is completely useless. Non intuitive app. Does not allow user to identify different work places. Does not give fare $$ with directions. Does not give you ability to run a future travel scenario. 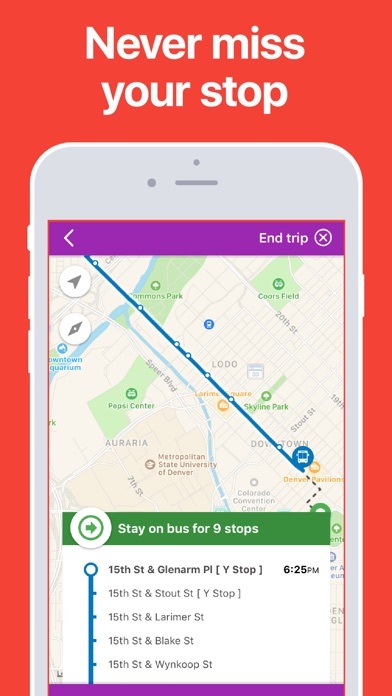 Was considering using transit instead of car but with this app. Much better than other apps I tried and it so far has not tried to force me to play stupid games. This app is useless. You'd think for $2.60 PER DIRECTION they could do something helpful. Honestly, the website (when it's working) is easier to navigate. AND THE ADS ARE STUPID! I'm already paying a ridiculous amount to ride the bus and I'm already looking at those stupid ads. Yeah-I want to sit through a 30 second ad before I can look up my bus route. This is a great improvement over the past apps. It runs almost like the transit app. I like the bus numbers. Sometimes I still use the transit app because it gives all of the buses in the area and the times they are going to arrive. This helps me to decide which corner of the intersection to go to if I missed one bus. It would be nice to have instructions as how to do things for those who are not intuitive. The destinations of the buses and the bus numbers are very helpful. Sometimes it would be nice to have the buses GPS to be updated a little more frequently. The number of RTD apps is confusing when looking for the most up to date one. Gave me completely wrong information. Will be deleting it immediately.